This beautifully designed book is a celebration of the joys and challenges of the teaching life. 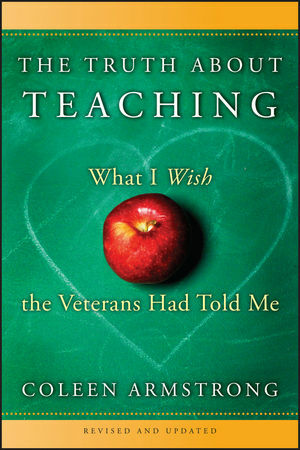 Author and veteran educator Coleen Armstrong is a wise, witty, and caring mentor. Her words of encouragement will resonate with new teachers, with students in teacher education schools, and with veteran teachers who wish to remember that they are not alone in an often lonely profession. From lesson plans to large classes; salaries to student engagement; germs to geometry-learning (or remembering) to love both the highs and lows of the profession has never been easier, or more fun. Coleen Armstrong is a thirtyyear teaching veteran who has received many awards for her work as an inspiring educator, including being named one of five finalists to the Teachers Hall of Fame. Coleen is a sought-after educational advice columnist, and recently wrote columns for Education Week's "Ask the Mentor" series in Teacher Magazine. Coleen also hosted a local television talk show on educational and community topics for ten years. Including words of wisdom like: Never lose sight of your own power. Chapter 2: The Profession and the Politics. Including words of wisdom like: You’ll learn far more than you'll ever teach. Schools will never run like businesses––nor should they. Chapter 3: Finding Your Teacher Persona. Including words of wisdom like: Create and cultivate a commanding presence. Don't feel the need to resolve every problem. Chapter 4: Money and Other Compensations. Including words of wisdom like: The toughest assignments often pay the least. Look for rewards in unconventional places. Chapter 5: Nuts and Bolts. Including words of wisdom like: Beg for chances to observe the most talented veterans. Chapter 6: Rules and Routines. Including words of wisdom like: Ask for help sooner rather than later. Stop your class two minutes early. Chapter 7: Keeping It Creative. Including words of wisdom like: Move heaven and Earth to get access to a VCR or DVD player. Play with a bit of old-fashioned competition. Chapter 8: Classroom Management––Otherwise Known as Discipline. Including words of wisdom like: The disciplinary conundrum is still educational rocket science. Everyone would rather be a success than a failure. Chapter 9: Tricky Strategies All Teachers Can Master. Including words of wisdom like: Know your own hot buttons––and then communicate them. Give your students regular pep talks. Including words of wisdom like: Create a private oasis, where every single student feels safe, cherished, and valued.